I’m in the process of building a home automation controller using my Raspberry Pi, and I figured it would be cool if it could display the current song and artist on my Pandora player. There were many options for a display — I could go with an LCD, an OLED, etc. I figured just to be different I would try a VFD display. VFD stands for “Vacuum Fluorescent Display”. VFDs are an older technology that has existed since the early 1960s. They differ from LCDs in that LCD displays typically have a backlight whereas a VFD emits light directly, in a similar manner to how a fluorescent light works. They often have a blue/green character color. The first thing to do was to select an appropriate display. I settled on a Noritake CU16025-UW6J. 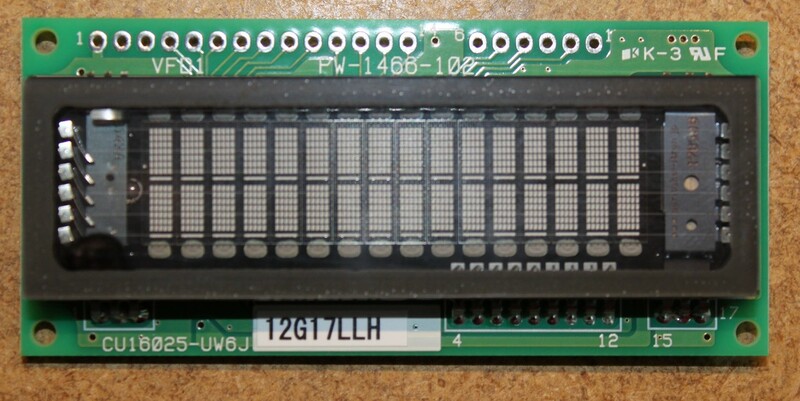 This is a 2×16 character display that interfaces via SPI or Parallel. Using an SPI interface only consumes three or four of the pi’s pins depending on how you wire it. Minimizing GPIO use is always nice. I was able to pick up this display for $35 on ebay. You’ll notice the display module has two headers. On the left there’s a 14-pin header (CN3) that’s used for parallel interfacing. On the right is a 6-pin header (CN1) that’s used for serial interfacing. We’ll be using the 6-pin header exclusively. On the back there is also a jumper, JP6, that you’ll need to populate in order to use the display in serial mode. Soldering JP6 was a little bit tricky as you have to solder it from the back of the board (I pushed the insulator on the header all the way to the top, soldered the header, and then pushed the insulator down). Note the resistor inserted on the connection to Raspberry Pi ping #19 (MOSI). The reason for this is that we’re interfacing a 3-pin SPI device to a 4-pin SPI device. Pin #2 on the VFD is biderectional — sometimes it’s used to send data while other times it’s used to receive data. The Pi on the other hand has a dedicated send pin (19) and receive pin (21). If we ever entered a state, perhaps due to a programming error where the pi and the VFD were both outputting to the same pin with different values, a high amount of current could flow and the GPIO could become damaged. Thus the resistor. I read several different web references on which resistor to use, with recommended values from 470 ohm to 10k ohm. I chose a 1K ohm resistor as that seemed sufficient to limit any current flow. Note that this is for a somewhat dated Raspbian running on one of my old B models. For a newer raspian you might want to run raspi-config and use the advanced options to enable the SPI driver instead of editing /etc/modprobe.d/raspi-blacklist.conf. Now we should have a raspberry pi with the SPI module being loaded automatically, and the python library installed. Let’s take a look at some of the more important bits. At the top of the file, there’s an import statement for the spidev module. That’s the module that knows how to talk on the SPI bus. Fortunately, we don’t have to bitbang the protocol; we can just call write() functions on the spidev module and the pi will handle the low level details of the protocol. Next we see the initialization routine. the key bit of this code is the call to spi.open(), which include an spi device number and a spi chip enable number. For the connections we diagrammed above, both of these arguments are zero. 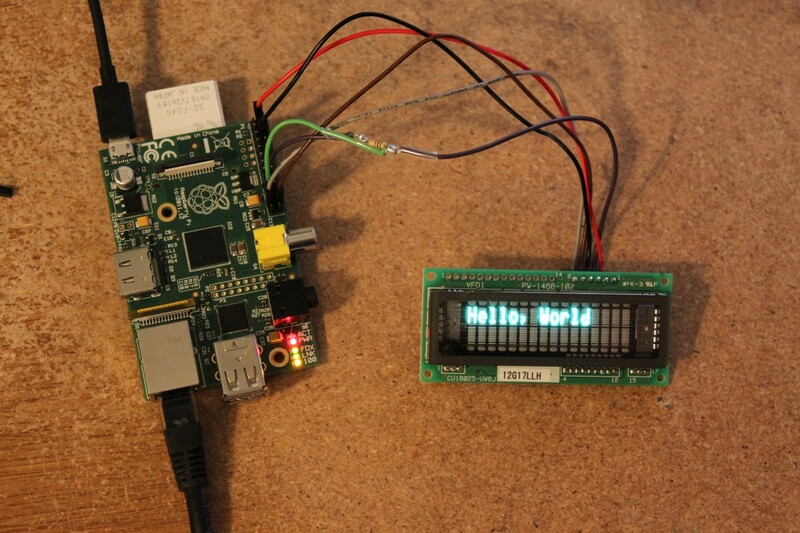 Each write to the display involves sending two bytes. The first byte is either 0xFA or 0xF8. 0xFA corresponds to the RS pin being high and 0xF8 corresponds to the RS pin being low. The RS pin is an artifact of the device’s parallel interface, but it’s important because this pin controls which functions are executed when we send the next byte. The datasheet has a table called “Software Commands” that explains which values of RS execute which functions. For example, according to the datasheet writing the parallel interface with RS set to L with 0×01 sent causes the display to clear. So, for us serial interface users, that means send 0xF8 followed by 0×01. Similarly on the parallel interface to send the letter “A” to the display one would set RS to high and write 0×41. For us serial interface users that means send 0xFA followed by 0×41. You can also read from the display, but I haven’t implemented that feature in my module, simply because the display doesn’t actually have anything that I care to read. The nice thing about not wanting to read anything is that you can lave the pi’s pin 21 disconnected if you like. vfd.py write "Scott was Here"
There’s a whole lot more that the display can do that I haven’t shown in this article. For example, you can control the brightness. You can turn a cursor on or off. You can write 8 user definable characters to the device. I understand this is an old post, but I’m interested in getting a VFD display working with my Pi. I find these are great nostalgic displays ideal for home automation, server stats or anything else you want to cobble together. I live in the UK with a little programming experiance and was wondering if you know of any good sources to get hold of one of these displays, or similar types. I understand these would be in short supply soon due to this type of technology. I purchased my displays from eBay.